We are heading into the home stretch! Remember the stir-fry earlier in the week that didn’t happen? It happened for lunch today. The recipe is: see what’s in the fridge and throw it in. Not an elegant dish, but crunchy-good! Here’s what I did this time. Make rice. I use my trusty rice cooker. Get everything that’s going in the stir-fry totally ready ahead of time because once you fire up the wok, things go FAST. Prep all the veg by cutting them into pieces about the same size. (This time I used an onion, two stalks of celery, two carrots, and a red bell pepper. 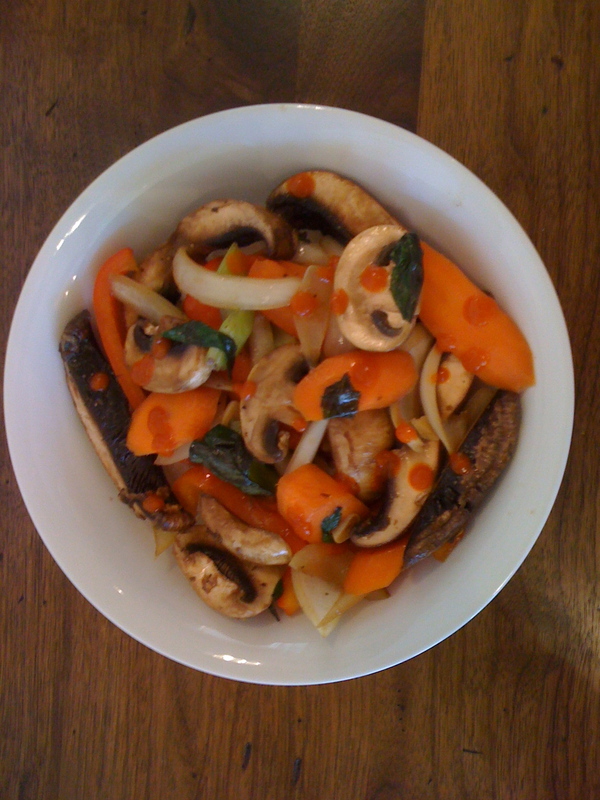 In a different bowl, I sliced up almost all my mushrooms–regular white ones as well as a couple of portobellos–and tore up the rest of the Thai basil.) Slice some garlic. Measure out your sauce: for this amount of veg, one tablespoon of soy sauce and two tablespoons of fish sauce with a dash of sugar will do. Now dump it into a serving bowl. I sprinkled it with some sriracha (do you know this hot sauce? I LOVE it.) It looks more carroty in the photo than it was; actually the mushrooms were the big deal. But go ahead and EAT! I decided to go ambitious for dinner: moussaka, which I have never made. As I read the recipe, I got the beginnings of a bad feeling. Prepping the vegetables is going to take an hour? Well, you have to partly-peel, slice, salt, drain (this is where the hour comes in), rinse, and dry the eggplants, and boil the potatoes. Okay, I’ll get all that going, then watch the news. While the potatoes are cooling, you preheat the oven, line two (two??) sheet pans with foil, and oil them. Next, you separate your eggs, lightly beat the whites, and spread bread crumbs on a plate. So this is all leading up to Step One: get your eggplant in the oven. You dip each slice in the egg whites, dredge it in the bread crumbs, and put it in one layer on the pans. This takes a while. Now we are ready to make the meat sauce. Finely chop two onions (then hold your face under the cold-water faucet until you can see again), mince the garlic, and chop the parsley. Measure out everything else. Then saute the ground lamb, add the onion and garlic, and keep sauteing; add the wine and simmer a while; add your spices, tomato paste and puree, and sugar. Let it simmer for about 15 minutes. All of this adds up to Step Two. Pull the eggplant out of the oven and set it over there to cool. On to Step Three: make the bechamel sauce. Lightly beat your egg yolks. Warm the milk. Now, melt the butter and whisk in the flour; let it cook for a bit. Add the warm milk in a steady stream, whisking away. Simmer until it thickens a bit. Take it off the heat, stir in the egg yolks and nutmeg, and put it back on the fire to thicken. This is all just prep for the main event: Step Four, assemble the moussaka. Grease the biggest baking dish you own, sprinkle the bottom with (more!) bread crumbs, and cover it with a layer of sliced potatoes. (Leave a small moat around the edges.) Top that with a layer of eggplant slices, then the meat sauce. Sprinkle with a quarter of the grated cheese. 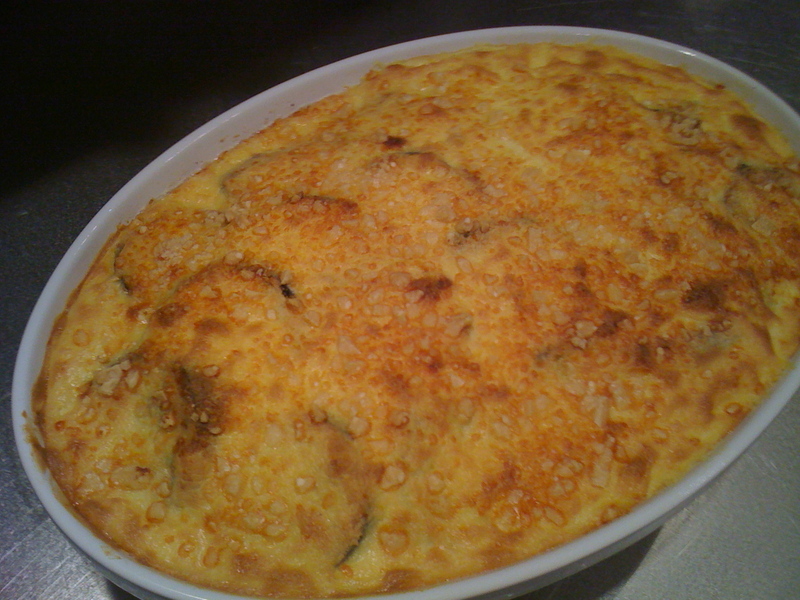 Add another layer of eggplant splices and top that with another quarter of the cheese. Now, pour the bechamel sauce over the whole thing, making sure the sauce fills up that moat. Put the rest of the cheese on top. Now heave a sigh of relief and put it in the oven! Okay, let’s assess our situation here. It’s 9:00 at night, I still haven’t eaten supper, and my kitchen is a horrendous effing mess. But on the up side (unless, when I ran out of breadcrumbs, it was a fatal mistake to sub in the panko breading), in about an hour I will have a nice piece of homemade moussaka. 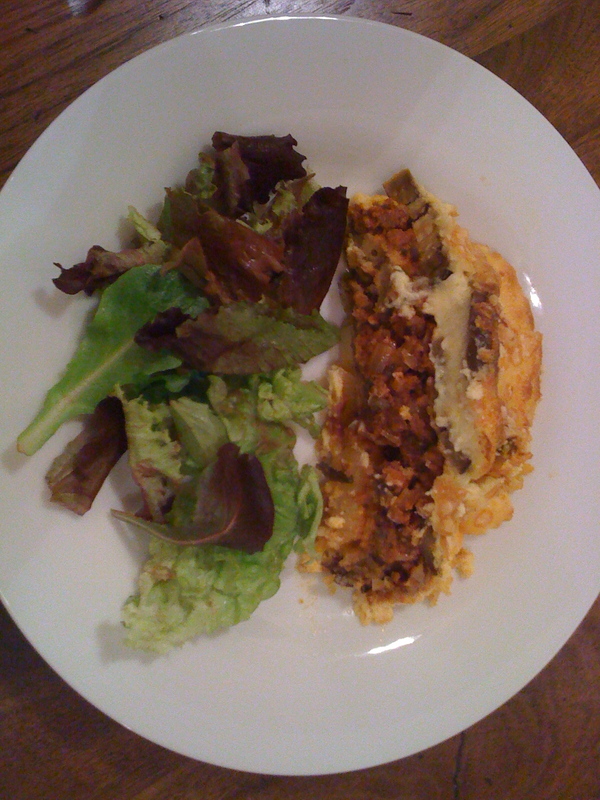 This entry was posted in Meal planning and tagged cooking Greek food, home cooking, meal planning, moussaka by judyramey. Bookmark the permalink.